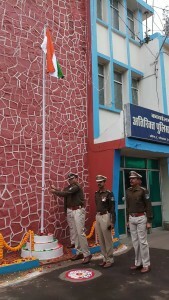 National flage to mark the celebration of India’s 70th Republic Day ceremony held at Police Control Room premises in Bhopal, Madhya Pradesh. On this occasion Dharamvir Singh, Superintendent of Police (Head Quarter) Bhopal along with other senior officers were present. Wali has been instrumental in crumbing the unabeted crimes during each of his postings in MP. As young and energetic IPS Irshad Wali takes on the new responsibility as DIG Bhopal urban, much expectations on the implementation of “smart policing” system in the state capital been built up on him.